Background: Hepatitis C virus (HCV) infection is a global public health problem and is a leading cause of morbidity and death, with regional variations in genotype prevalence. Objectives: This study aimed to explore the prevalence of anti-HCV seropositivity among patients with hereditary anemias, the association of anti-HCV seropositivity with selected risk factors and the common HCV genotypes. Patients and Methods: This prospective descriptive study was carried out on patients with hereditary anemias from January 2010 through December 2014 registered at the Center for Hereditary Blood Diseases. A total of 2778 patients (1282 males and 1496 females) were recruited, their mean age was 13.19 ± 9.40 years. Patients were screened for HCV antibodies using an enzyme-linked immunosorbent assay test. Quantitation of the HCV viral load and genotype were assessed using polymerase chain reaction (PCR). Results: The frequency of anti-HCV seropositivity was higher in 2010 (33.7%) and declined progressively over the following 4 years (31.7%, 20.2%, 10.8%, and 9.2%), respectively. Out of 424 patients with two positive anti-HCV tests at least 6 months apart, 215 (50.7%) had positive results with PCR. The most frequent genotype was 4 in 43 (56.5%), followed by 1 in 31 (40.7%) patients; 1a: 21.1% and 1b: 19.6%. A significant association was found between anti-HCV seropositivity and type of disease, and deferoxamine pump use, P < 0.05. Conclusions: Anti-HCV seropositivity is declining among multitransfused patients with hereditary anemias in Basra, Iraq, and genotype 4 is the most common in these patients. Hepatitis C virus (HCV) infection is a global public health problem. Overall, the available data suggest that the prevalence of HCV infection is approximately 2.2%–3.0% worldwide. While individual estimates from different regions or countries have undergone some changes since the first estimates were made by the WHO in 1997, the overall picture is still similar, with the highest prevalence of HCV infection found in the African and Eastern Mediterranean regions. An estimated 350,000 people die of HCV-related conditions, including cirrhosis and liver cancer annually. Hepatitis C is the most common chronic bloodborne infection. In the past, chronic hepatitis C was responsible for >90% of posttransfusion hepatitis cases. Regular blood transfusion is the mainstay of treatment for patients with thalassemia. In addition, patients with sickle cell disease (SCD) may require multiple blood transfusions and may, therefore, be exposed to transfusion-transmitted infections, such as the hepatitis B virus (HBV) and HCV. Transmission of HCV involves direct exposure to contaminated blood and is associated with intravenous drug use, iatrogenic exposures, tattooing, body piercing, and less frequently through vertical transmission and high-risk sexual behavior. As exposure rates for sharing drug preparation equipment are generally higher, the population-attributable risk percentage of HCV is even higher in this group – up to 43%. The HCV genome has stereotypical genetic heterogeneity. Based on a polygenetic analysis of HCV sequences, 6 major HCV genotypes are recognized, designated 1–6, with multiple subtypes within each viral genotype. Determination of the HCV genotype provides clinically important information that can be used to direct the type and duration of antiviral therapy and to predict the likelihood of HCV clearance after therapy. HCV genotypes are geographically clustered. HCV genotype 1 is the most prevalent worldwide (46.2%), followed by genotype 3 (30.1%). Genotypes 2, 4, and 6 account for 22.8% of all cases, while genotype 5 comprises <1% of cases. The improvement of people's knowledge about transfusion-transmitted infection risk factors, blood screening strategies, and a national HBV vaccination program for all neonates has led to a dramatic decrease in the prevalence of transfusion-transmitted infections. However, posttransfusion transmission of HCV still remains a major health concern in multi-transfused patients. The current study aimed to explore the prevalence of anti-HCV seropositivity among patients with different types of hereditary anemias, the association of anti-HCV seropositivity with selected risk factors and the most common HCV genotypes. This prospective descriptive study was carried out on patients with different types of hereditary anemias (thalassemias and SCD) over 5 years (from the first of January 2010 through December 2014) who were registered at Basra Center for Hereditary Blood Disease. A total of 2778 patients (1282 males and 1496 females), with ages ranging from 9 months to 60 years were included in the study. Patient information included date of birth, gender, diagnosis, number of blood transfusions/year, history of operations or dental interventions, and iron chelation therapy equipment use (i.e. deferoxamine infusion pump). SCD: includes sickle cell anemia (SCA), sickle/β-thalassemia, Hb SC disease, and Hb SD disease. Diagnosis of these 3 groups was confirmed through high-performance liquid chromatography and capillary electrophoresis. Informed consent was obtained from all participants and/their families for enrollment in the study. This study was approved by the Ethical Committee of College of Medicine, University of Basra. A blood sample was taken from each patient (2 ml) during their visit to the outpatient clinic for follow-up. The detection of HCV Ab in the serum was done through enzyme-linked immunosorbent assay testing using a Biorex kit. The patients were screened every 6–12 months,, and if the results of 2 consecutive HCV Ab tests were positive 6 months apart, then a second blood sample was drawn to detect the HCV RNA viral load and viral genotype by real-time PCR, using an applied biosystem 726, CA, USA, with the cutoff point to detect positive results set at >250 HCV copies/ml of blood and GEN-C2.0 kit for HCV genotype, nuclear laser medicine diagnostic/Italy. All statistical analyses were carried out using the Statistical Packages for the Social Sciences (SPSS Inc., Chicago, IL, USA) software version 19.0. Comparisons of proportions were performed by crosstab using the Chi-square test. Statistical tests with P < 0.05 were considered statistically significant. Binary logistic regression analysis was done for the analysis of different variables, and for several variables, the odds ratios and 95% confidence intervals were assessed. A total of 2778 patients with different types of hereditary anemias were enrolled in the study; the majority of study patients were ≤19 years 2219 (79.8%) and only 83 (3%) were ≥40 years, with a mean age of 13.19 ± 9.40 years. There was no significant difference in HCV seropositivity among between males and females, P > 0.05. However, HCV seropositivity was highest among patients aged 10–29 years, P < 0.001, [Table 1]. SCD was the most common hereditary anemia among screened patients 1780 (64.1%), followed by TDT 821 (29.5%) and NTDT 177 (6.4%). Among patients with TDT, all of the 821 (100%) patients had β-TM. For those with NTDT, 100 (85.5%) had β-TI and 17 (14.5%) had α-TI. Regarding patients with SCD, sickle/β–thalassemia was the most common type, reported in 1113 (62.5%) patients, followed by SCA in 487 (27.3%), and other SCDs in 180 (10.2%) patients. 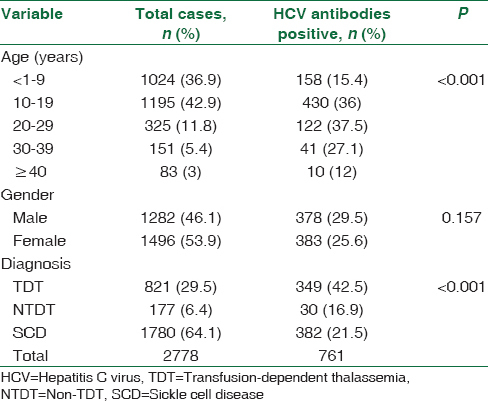 The HCV seropositivity was highest among patients with TDT where it was detected in 349 (42.5%), followed by SCD in 382 (21.5%), and NTDT in 30 (16.9%), P <0.001, [Table 1]. The frequency of anti-HCV seropositivity for all hereditary anemias/year was highest in 2010 (33.7%) and declined progressively over the following 4 years (31.7%, 20.2%, 10.8%, and 9.2%), [Figure 1]. A significant positive association was found between anti-HCV seropositivity and type of disease (β-TM) and deferoxamine pump use, P < 0.05, [Table 3]. In this study, anti-HCV seropositivity among patients with various hereditary anemias declined through the 5-year study period, from 33.8% to 9.2%. For patients with TDT, which represents the highest prevalence group, the anti-HCV seropositivity also declined, from 36.7% to 12.5%. In addition, genotype 4 followed by 1a was found to be the most common among these patients. Among the healthy Iraqi population, the prevalence of anti-HCV Ab was reported to be 0.4%. This frequency is comparable to those reported in Kuwait, 0.44%, and Qatar, 0.51%. However, the same study reported lower frequencies in the United Arab Emirates (0.24%) and in Saudi Arabia for HCV among nationals (1.65%). The declining prevalence of HCV reported in this study is in agreement to that reported by Alavian  and Kosaryan and Aliasgharian in Iran. This decline could be attributed to the improvement of the screening program for blood donors and risky patients and proper management of patients with chronic HCV infections, in addition to education about preventive measures. The anti-HCV seropositivity (9.2%) in our study in 2014 is lower than those reported by Alawadi (11.72%) among patients with hereditary blood diseases registered in Babylon, Iraq, and Yazaji et al. in Syria (11.32%), but higher than those reported by Dunford et al. among multi-transfused patients in Vietnam (6%) and Ocak et al. (4.55%) in Turkey. β-thalassemia major was the main diagnosis among TDT patients, and approximately 12.5% of these patients had positive results on screening for HCV Ab in 2014. This result is lower than the prevalence in patients with β-TM in other parts of Iraq: 46% in Ibn-Al Balady Thalassemia Center, Baghdad, 26.4% in Diyala, and 17% in Mosul. In addition, the prevalence in the current study is lower than those reported by Al-Naamani et al. in Oman (41%), Mohamoud et al. in Egypt (37.11%), Jafroodi et al. in Iran (13.6%), and Saeed et al. in Pakistan (55.7%). This can be attributed to improvements in the screening of blood donors. However, the seropositivity of anti-HCV in TDT patients is higher than the (4.3%) reported by Ilhan et al. in Gujarat in India. Another finding is that patients with TDT have a higher risk for acquiring HCV, which is attributed to increased requirements and numbers of blood transfusions compared to those required for patients with SCD and NTDT, with an inevitable development of iron overload and the use of iron chelators, such as deferoxamine. Patients with NTDT may require occasional or even frequent transfusions in certain clinical settings and for defined periods. The anti-HCV seropositivity of NTDT in Basra in 2014 (3.7%) was less than that reported by Ilhan et al. in India (6.2%), which could be attributed to infrequent exposure to risk factors, such as blood transfusions or the need for a deferoxamine pump. SCD represented the main group in this study, but the seropositivity for HCV Ab was only (8.2%). This result is higher than those of Ejiofor et al. in Nigeria (6.6% among the transfused and 5.3% among nontransfused SCA patients) and Al-Noomani et al. in Saudi Arabia (3.7%) but lower than that of Boroujerdnia et al. in Iran (12.5%). Out of 424 patients with positive HCV Ab, 215 (50.7%) had positive PCR results. This finding is almost identical to that of Al-Naamani et al. in Oman, where the percentage of positive PCR results was 51%. The most frequent genotype detected in this study was genotype 4 followed by 1a. Genotype 4 was also found to be the most common genotype among multitransfused patients in other parts of Iraq as reported by Khalid and Abdullah in Mosul  and Othman et al. in Duhok, North of Iraq, although genotype 1b and genotype 3a were the second-most common genotypes after genotype 4 in these studies, respectively., This result is also in agreement with that found by Al-Sweedan et al. in Jordan. In contrast, genotypes 1 and 3 are the most frequent genotypes detected in Bahrain  and the United Arab of Emirates. In Saudi Arabia, genotypes 1 and 2 are the most common. Genotypes 3a and 1b were both found to be the most common genotypes among TDT patients in Iran, and genotypes 3a and 3b were found to be the most common in Pakistan. It was reported that the Middle East and North Africa have the highest number of cases with genotype 4. In addition, the Shannon diversity Index computed for each country revealed that Iraq has a low index which indicates that most infections belong to one or two dominant genotypes. A significant association between HCV infection and type of disease (β-TM) and deferoxamine pump use was reported in the current study, whereas age, number of blood transfusions, and splenectomy were not found to be associated with HCV infection. Different studies in different parts of Iraq have revealed conflicting results: Al-Wtaify andHassan in Basra, Raham et al. in Diyala Province, and Al-Doori in Al-Anbar Province  reported that increasing age is a risk factor for HCV seropositivity, whereas Noaman in Diyala did not report any such association. The significant association with increasing age may be due to most of these patients having TDT and higher rates of these patients receiving deferoxamine therapy. Subcutaneous, intramuscular, and intravenous injections have been found to be risk factors for HCV seropositivity. This could explain our finding concerning the use of a deferoxamine pump as one of the risk factors for HCV. We did not report a significant association between HCV seropositivity and the number of blood transfusions/year, a result which is in contrast to those reported by Karaca et al. in Turkey  and Al Noomani et al. in Saudi Arabia, who reported a significant association with the number of blood units received/month. This could be related to the proper screening of blood donors, which decreases the risk of recurrent exposure to infected blood. There are several limitations of this study, including the occasional unavailability of genotype testing in the Gastroenterology Center and the cost of the test, which explains why many patients with positive PCR results do not undergo genotype testing. Another limitation is that other risk factors were not evaluated, such as other surgical or dental procedures or diabetes mellitus, as disease complications. HCV Ab seropositivity is declining among multitransfused patients with different hereditary anemias in Basra, and genotype 4 is the most common genotype in these patients. In comparison with other parts of Iraq, it seems that Basra has the lowest frequency of HCV infections. However, due to the large number of patients, survival is still a serious risk for these patients. Thus, we recommend continuing surveillance of blood donors, health-care personnel and patients, in addition to hepatitis markers screening by special type of PCR (nucleic acid amplification technique) for the diagnosis of HCV during the window period and continuous supply of anti-HCV drugs. We would like to thank Dr. Ahmed Abdulwahid Salman for carrying out the viral load and genotypes of HCV, Dr. Zinah Anas Salman for her great help with the statistical analysis, and Halla Ghazi for her participation in computing patient data. Marie MA. Genotyping of hepatitis C virus (HCV) in infected patients from Saudi Arabia. Afr J Microbiol Res 2011;5:2388-90. Lavanchy D. The global burden of hepatitis C. Liver Int 2009;29 Suppl 1:74-81. Averhoff FM, Glass N, Holtzman D. Global burden of hepatitis C: Considerations for healthcare providers in the United States. Clin Infect Dis 2012;55 Suppl 1:S10-5. Abdulla MA, Al Qamish JR. Hepatitis C virus infection: A single center experience. Bahrain Med Bull 2008;30:1-9. Abro AH, Al-Dabal L, Younis NJ. Distribution of hepatitis C virus genotype in Dubai, United Arab Emirates. J Pak Med Assoc 2010;60:987-90. Alawadi NB. Prevalence of hepatitis B and C virus infections among Iraqi patients registered to Babylon center for inherited blood disorders. Int J Adv Res 2014;2:383-8. Boroujerdnia MG, Assarehzadegan MA, Zandian K. Hepatitis B and C infection and different genotypes of HCV among sickle cell anemia patients in Ahvaz, South-Western Iran. Jundishapur J Microbiol 2013;6:e6368. Dunford L, Carr MJ, Dean J, Waters A, Nguyen LT, Ta Thi TH, et al. Hepatitis C virus in vietnam: High prevalence of infection in dialysis and multi-transfused patients involving diverse and novel virus variants. PLoS One 2012;7:e41266. Page K, Morris MD, Hahn JA, Maher L, Prins M. Injection drug use and hepatitis C virus infection in young adult injectors: Using evidence to inform comprehensive prevention. Clin Infect Dis 2013;57 Suppl 2:S32-8. Mohan N, Gonzalez-Pertalta RP, Fujisawa T, Chang M, Heller S, Jara P, et al. Chronic hepatitis C virus infection in children. J Pediatr Gastroenerol Nutr 2010;50:123-31. Zarkesh-Esfahani SH, Kardi MT, Edalati M. Hepatitis C virus genotype frequency in Isfahan province of Iran: A descriptive cross-sectional study. Virol J 2010;7:69. Chevaliez S, Pawlotsky JM. Diagnosis and management of chronic viral hepatitis: Antigens, antibodies and viral genomes. Best Pract Res Clin Gastroenterol 2008;22:1031-48. Taher A, Vichinsky E, Musallam K, Cappellini MD, Viprakasit V. Guidelines for the Management of Non-Transfusion Dependent Thalassemia (NTDT). Ch. 8. Nicosia, Cyprus: Thalassemia International Federation; 2013. p. 70-2. Ibrahim HM, Hassan A, George E, Sim GA, Othman IS, Ghazali IM, et al. Management of transfusion dependent thalassemia. Malaysia: Ministry of Health and Academy of Medicine; 2009. p. 50-2. Viprakasit V, Origa R. Genetic basis, pathophysiology and diagnosis. In: Cappellini MD, Cohen A, Porter J, Taher A, Viprakasit V, editors. Guidelines for the Management of Transfusion Dependent Thalassemia (TDT). 3rd ed. Nicosia, Cyprus: Thalassemia International Federation; 2014. p. 1-25. Buchanan GR, Yawn BP, Afenyi-Annan AN, Ballas SK, Hassell KL. Evidence-Based Management of Sickle Cell Disease: Expert Panel Report, 2014. U. S. Department of Health and Human Services, National Institutes of Health, National Heart, Lung and Blood Institutes; 2014. p. 1-10. Tarky AM, Akram W, Al-Naaimi AS, Omer AR. Epidemiology of viral hepatitis B and C in Iraq: A national survey 2005-2006. Zanco J Med Sci 2013;17:370-80. Mohamoud YA, Riome S, Abu-Raddad LJ. Epidemiology of hepatitis C virus in the Arabian gulf countries: Systematic review and meta-analysis of prevalence. Int J Infect Dis 2016;46:116-25. Alavian SM. Hepatitis C infection in Iran; a review article. Iran J Clin Infect Dis 2009;4:47-59. Kosaryan M, Aliasgharian A. Decrease of hepatitis C burden in patients with transfusion dependent beta thalassemia major, Thalassemia Research Center, 1995–2014. J Pediatr Rev 2015;3:e679. Yazaji W, Habbal W, Monem F. Seropositivity of hepatitis B and C among Syrian multi-transfused patients with hemoglobinopathy. Mediterr J Hematol Infect Dis 2016;8:e2016046. Ocak S, Kaya H, Cetin M, Gali E, Ozturk M. Seroprevalence of hepatitis B and hepatitis C in patients with thalassemia and sickle cell anemia in a long-term follow-up. Arch Med Res 2006;37:895-8. Abed BA. Prevalence of hepatitis C virus among thalassemia patients in Ibn-Al Balady hospital. J Al Nahrian Univ 2010;13:121-6. Raham TF, Wahed SS, Alhaddad HN. Prevalence of hepatitis C among patients with thalassemia in Diyala-Iraq. Iraqi Acad Sci J 2011;24:113-20. Khalid MD, Abdullah BA. Prevalence of anti-HCV antibodies among thalassemia patients in Mousl city-Iraq. J Life Sci 2012;6:489-91. Al-Naamani K, Al-Zakwani I, Al-Sinani S, Wasim F, Daar S. Prevalence of hepatitis C among multi-transfused thalassemic patients in Oman. Sultan Qaboos Univ Med J 2015;15:e46-51. Mahmoud RA, El-Mazary AA, Khodeary A. Seroprevalence of hepatitis C, hepatitis B, cytomegalovirus, and human immunodeficiency viruses in multitransfused thalassemic children in upper Egypt. Adv Hematol 2016;2016:9032627. Jafroodi M, Davoudi-Kiakalayeh A, Mohtasham-Amiri Z, Pourfathollah AA, Haghbin A. Trend in prevalence of hepatitis C virus infection among β-thalassemia major patients: 10 years of experience in Iran. Int J Prev Med 2015;6:89. Saeed U, Waheed Y, Ashraf M, Waheed U, Anjum S, Afzal MS, et al. Estimation of hepatitis B virus, hepatitis C virus, and different clinical parameters in the thalassemic population of capital twin cities of Pakistan. Virology (Auckl) 2015;6:11-6. Ilhan G, Ekiz F, Acipayam C, Oktay G. Seroprevalence of hepatitis B, hepatitis C and HIV in patients with hemoglobinopathy patients. Cukurova Med J 2014;39:784-7. Ejiofor OS, Ibe BC, Emodi IJ, Ikefuna AN, Ilechukwu GC, Emechebe G, et al. The role of blood transfusion on the prevalence of hepatitis C virus antibodies in children with sickle cell anaemia in Enugu, South East Nigeria. Niger J Clin Pract 2009;12:355-8. Al Noomani NM, Mahmoud NA, Khalil SA. Seroprevalence of hepatitis B virus, hepatitis C virus, and human immunodeficiency virus infections in patients with hereditary hemoglobinopathies from Saudi. Egypt Liver J 2011;1:97-101. Daw MA, Dau AA. Hepatitis C virus in Arab world: A state of concern. Sci World J 2012;2012:719494. Ramia S, Eid-Fares J. Distribution of hepatitis C virus genotypes in the middle east. Int J Infect Dis 2006;10:272-7. Janahi EM, Al-Mannai M, Singh H, Jahromi MM. Distribution of hepatitis C virus genotypes in Bahrain. Hepat Mon 2015;15:e30300. Khalid MD, Abdullah BA. Hepatitis C virus genotype in Iraq. Iraqi J Biotech 2012;11:475-80. Othman AA, Eissa AA, Markous RD, Ahmed BD, Al-Allawi NA. Hepatitis C virus genotypes among multiply transfused hemoglobinopathy patients from northern Iraq. Asian J Transfus Sci 2014;8:32-4. Al-Sweedan SA, Jaradat S, Amer K, Hayajneh W, Haddad H. Seroprevalence and genotyping of hepatitis C virus in multiple transfused Jordanian patients with β-thalassemia major. Turk J Hematol 2011;28:47-51. Shahraki T, Shahraki M, Moghaddam ES, Najafi M, Bahari A. Determination of hepatitis C genotypes and the viral titer distribution in children and adolescents with major thalassemia. Iran J Pediatr 2010;20:75-81. Akhtar S, Moatter T, Azam SI, Rahbar MH, Adil S. Prevalence and risk factors for intrafamilial transmission of hepatitis C virus in Karachi, Pakistan. J Viral Hepat 2002;9:309-14. Al-Wtaify AS, Hassan MK. Prevalence of hepatitis C virus among multitransfused thalassemic children in Basra-Iraq. Qatar Med J 2000;9:58-61. Al-Doori AM. Prevalence of hepatitis B and hepatitis C among blood donors in Al Anbar governorate. Fac Med Baghdad 2006;48:149-51. Noaman NG. Prevalence of hepatitis C virus infection among blood donor and certain risky groups in Diyala province. Diyala J Med 2012;2:46-52. Karaca C, Cakaloqlu Y, Demir K, Ozdil S, Kaymakoqlu S, Badur S, et al. Risk factor for the transmission of hepatitis C virus infection in the Turkish population. Dig Dis Sci 2006;51:365-9.